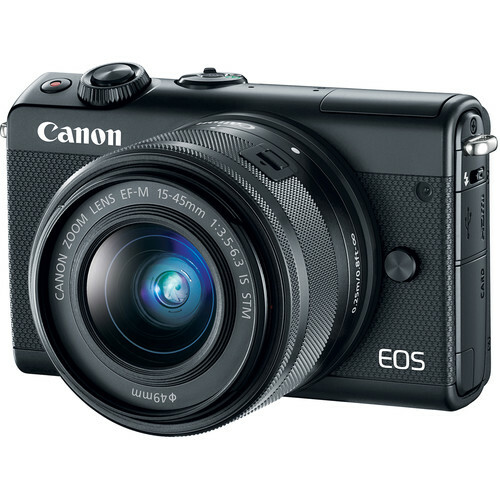 Looking for the best 2018 Black Friday & Cyber Monday Canon EOS M100 bundle deals, sales, discounts and rebates? Here is the buying guide for you! The entry-level Canon EOS M100 is an inexpensive, lightweight, easy-to-use and fun mirrorless camera, which is aimed squarely at smartphone photographers looking to step up the quality of their photos and video. The Canon EOS M100 is Canon’s smallest and cheapest mirrorless interchangeable lens camera and it can produce very good still photos and video, even in low light. Overall, the EOS M100 is a solid camera that represents a great value in Canon’s lineup and it gets 79% overall score and Gold Award from the experts at DPReview. Below are the best 2018 Black Friday & Cyber Monday Canon EOS M100 bundle deals & sales from the biggest online retailers. Just get it this holiday shopping season if you are interested. $200 off on Canon EOS M100 with 15-45mm Lens: $399 at Amazon, B&H, Adorama. $320 off on Canon EOS M100 with 15-45mm and 55-200mm Lenses: $629 at Amazon, B&H, Adorama. Read more: Canon Black Friday 2018 and Canon Cyber Monday 2018.